Did Jordan win three NCAA basketball titles? Was LeBron as dominant in high school as Abdul-Jabbar? There has been lots of talk about greatness over the past few weeks. In large part, this has been because the NBA playoffs were lackluster and nondescript. With the Cleveland Cavaliers and the Golden State Warriors steamrolling their way to the NBA Finals, the dominance created a vacuum that was filled by debates over greatness: the greatest team, the greatest player. Could the 1996 Chicago Bulls defeat the Golden State Warriors of the past two seasons? The NBA has a new champion, the Golden State Warriors, but an old debate rages: Who is the greatest of all time? Who is the GOAT? The conversations usually boil down to Michael Jordan and LeBron James, although now that James has failed to win a fourth NBA championship, critics say the debate over the GOAT is over. Hands down, they say, the GOAT is Michael Jordan. The most intriguing aspect of the debate is that the player rarely brought up in the conversation may be the legitimate GOAT: Kareem Abdul-Jabbar. Leaving Abdul-Jabbar out of the conversation was so egregious that I was compelled to jump in and make the case: Abdul-Jabbar is either the greatest of all time or, at worst, the second greatest, but he must be in the conversation, even if you include active players such as LeBron James and now Kevin Durant. 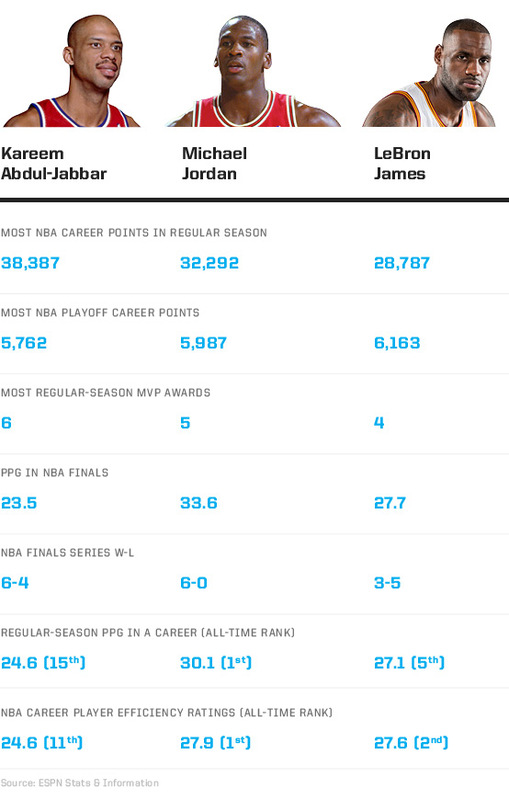 Why is Abdul-Jabbar left out of this conversation? A bias against big men? His famously sour relationship with the news media? His early and outspoken embrace of orthodox Islam? None of this should have anything to do with his legitimate standing as the GOAT, but we know it does. Abdul-Jabbar has an impressive résumé as a winner, as a scholar, as an activist. Yet he is placed a distant second, or even third, behind Jordan and James and now behind Durant. Often he is not mentioned. Each of us has our standard of greatness. For devotees of analytics, greatness is all about the numbers: statistics, cold hard facts, how many titles, how many points. How much? How many? How often? How many MVP awards, how many points, how many rebounds, field goal percentage. Take your pick. Abdul-Jabbar is the author and owner of the most unblockable shot in basketball history: the skyhook. He was a six-time NBA MVP, a 19-time NBA All-Star, a 15-time All-NBA selection and an 11-time NBA All-Defensive Team member. He was a member of six NBA championship teams as a player, two as an assistant coach. Abdul-Jabbar is the NBA’s all-time leader in points scored (38,387). At one point or another, he was also the leader in games played (1,560), minutes played (57,446), field goals made (15,837), field goal attempts (28,307), blocked shots (3,189), defensive rebounds (9,394), career wins (1,074) — and personal fouls (4,657). I filter greatness through many prisms. I view greatness through the prism of longevity and one’s potential to have an enduring legacy. Viewed in this manner, Abdul-Jabbar wins. From his career at Power Memorial High School, where he led his team to 71 consecutive victories, to college, where he led UCLA to three consecutive national championships, through the NBA and the sports afterlife, where he has become an author and a filmmaker, Abdul-Jabbar has been a consistent and forceful presence. I filter greatness through an Afrocentric prism and hold black athletes to a higher, more unique standard. When you consider the hurdles African-Americans have had to overcome — desegregating sports leagues, integrating intercollegiate athletics, breaking through as head coaches and executives — black athletes in the United States have traveled a hard road to glory. Indeed, whether you are an athlete, an aspiring partner in a law firm, a journalist or a firefighter, being black, as James said before the NBA Finals, is tough. My criteria for greatness, then, attempts to project whose presence will resonate across decades because of how they’ve used their platform to advocate for social justice. Kareem Abdul-Jabbar #33 of the Los Angeles Lakers looks on from the bench against the Boston Celtics during an NBA basketball game circa 1984 at The Forum in Inglewood, California. Abdul-Jabbar played for the Lakers from 1975-89.
Who most effectively performs on the court, while resisting and fighting against racism? Who has made it easier for the next generation? Who has most effectively passed the torch and added to the foundation? These are factors I consider when discussing the GOAT. As a student at UCLA, Abdul-Jabbar joined student protests in the late 1960s. In 1967 at the age of 19, he flew to Cleveland to participate in the Cleveland Summit organized by Jim Brown. Known then as Lew Alcindor, Abdul-Jabbar joined other GOATs in supporting Muhammad Ali’s decision, as a conscientious objector, not to be drafted into the U.S. Army. I can see James making that trip at age 19; I cannot see Jordan making that trip. Among active players, James edges out Durant. James and Durant have careers that continue to unfold. James has won more titles and has been more publicly involved on the social justice front. Durant has largely been silent — or, at least, not publicly vocal — on social injustice issues. Perhaps that will change now that his stage has expanded. But here are the statistics that, in my book, give Abdul-Jabbar the edge: several books published, books that mostly deal with African-American history. His most recent book examines his relationship with legendary UCLA coach John Wooden. His documentary, On The Shoulders of Giants, offers a revealing look at the Harlem Rens. Abdul-Jabbar recently recorded a documentary tracing his personal journey. As a college player, Abdul-Jabbar arguably compelled the NCAA rules committee to ban the dunk. The legislation was called the Lew Alcindor rule. And James may have been the inspiration behind the move to block high school athletes from going straight into the NBA. Jordan advocates point out that Jordan owns an NBA team. That is the sort of economic imperative that Brown advocated as one of the only means of achieving freedom: create jobs, control the means of production as much as possible. Whose legacy will resonate across decades? Jordan’s? James’? Durant’s? A player still unknown? Who knows? But for the here and now, Kareem Abdul-Jabbar, from my perspective, is the GOAT. You may not put him at the top of your list, but if Abdul-Jabbar is not part of the discussion, you’re having the wrong conversation.